The Mumbai police have received intelligence inputs that some terrorists from the Tibetan region of China may sneak in to India to eliminate the Tibetan spiritual guru, the Dalai Lama. The intelligence inputs, a copy of which is with TOI, states that a Chinese national of Tibetan origin by the name Tashi Phuntsok is likely to enter India to gather intelligence on the Tibetan administration as well as to cause harm to the Dalai Lama. The input further states that six Chinese nationals of Tibetan origin, including Phuntsok, possibly from Chinese secret services, are suspected. "A good number of Chinese youth enter India on business visas, ostensibly for some clandestine activities. It's likely that they may try to visit certain areas prohibited for Chinese like Tibetan camps. The Dalai Lama visits Mumbai and other places in Maharashtra. The threat to him must not be underestimated. Loss of Chinese passport and recovery of unknown Chinese passport need to be reported promptly, so that the concerned agencies can question them. In this regard, the activities of the followers of 'Shugden cult - an anti-Dalai Lama group - need to be kept under strict vigil," the report said. The Mumbai police have informed Tibetan organizations and directed the special branch and the local police to keep police officers updated about the Dalai Lama's visit to Mumbai. "He often comes to Mumbai and even goes to slums and mixes with people. We will have to enhance security cover form him in Mumbai,'' said a police officer. The Dalai Lama, 77 years old, now has new reason to keep his body guards. 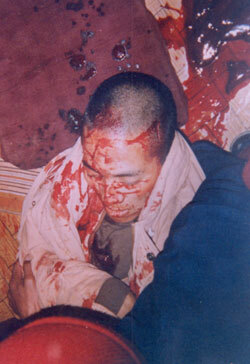 Newsweek, in February 1997, covered brutal murders of 3 monks close to the Dalai Lama. Newsweek's article also covered the lead role of NKT's angry campaign against the Dalai Lama. ""Three members of the Dalai Lama's inner circle were brutally slain on the night of Feb 4 in a bedroom just a few hundred yards from His Holiness's exile residence in the northern Indian city of Dharmsala. 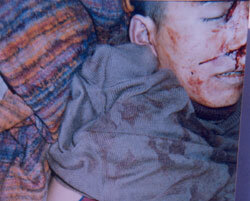 The next morning monks found the Dalai Lama's close friend and confidant 70-year-old Lobsang Gyatso, dead on his bed. Two young monks, Nagawang Lodoe and the Dalai Lama's Chinese-language interpreter, Lobsang Nagwang, died within hours of the attack. Each victim had been stabbed 15 to 20 times, leaving the walls of the small monk's chamber splattered with blood. Police believe it was the work of five to eight attackers...The savagery of the attack immediately steered police to search for fanatics of some kind. So did the death threats that followed against 14 more members of the Dalai Lama's entourage. Now Indian police believe the murders were committed by an obscure Buddhist sect that takes its name and inspiration from a minor but ferocious Tibetan deity: the Dorje Shugden...The Shugdens worship a god who is often depicted wearing necklaces of human heads - symbols of conquered vices and transgressions. He is a sword-wielding warrior figure, riding a snow lion through a sea of boiling blood...Dorje Shugden has had an underground following among Tibetans obsessed with doctrinal purity for centuries. ...the followers of the NKT have painted a hostile portrait of the Dalai Lama that is unrecognizable to mainstream Buddhists-indeed, to millions around the world who revere the Nobel Peace Prize winner and champion of Tibet...Above all, the Shugdens are angry that the Dalai Lama is promoting dialogue between the Yellow Hats and another major branch of Tibetan Buddhism, Nyingma, or the Red Hats. The Shugdens consider it a sin even to talk to Red Hats, or to touch Nyingma religious works. The police believe that one of the reasons the men were killed was that the old sage, Lobsang Gyatso, was a particularly active intermediary between the Dalai Lama and the Red Hats." However, this turned out to be a false statement from Kelsang Gyatso of NKT. Since then, NKT has organized protest rallies and Internet sites against the Dalai Lama, more robust and even less appropriate than NKT's campaign in the 1990s. 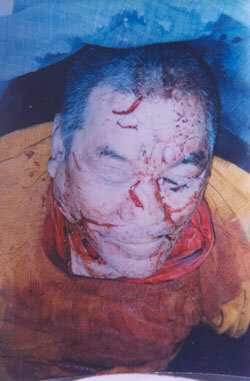 The extent, if any, of NKT's involvement in the 'Shugden murders' described in Newsweek remains unclear. Kelsang Gyatso's denial of any involvement is suspect because at the same time Kelsang Gyatso promised that his days of attacking the Dalai Lama were over. NKT continues to build its fortune on government subsidies and the donations of followers - who discount any investigation into Shugden, Kelsang Gyatso or NKT and the experiences of hundreds of previous NKT followers subjected to sexual, psychological or security abuse inside NKT. NKT's Shugdenism is blinding as well as hazardous.